Planets get all the attention — just look at the ruckus raised when Pluto was demoted or anytime NASA announces exoplanet discoveries. But on Friday, asteroids take center stage with their very own Asteroid Day, an annual event started in 2015 to commemorate the Tunguska event. There’s more to these space objects, however, than collisions and explosions. They also offer scientists a glimpse into the history of our solar system and may help us better understand the ground far beneath our feet. NASA (where “every day is asteroid day,” according to its Facebook page) will be hosting a live chat about how researchers find and study near-Earth objects. It begins at 9 a.m. Arizona time Friday at facebook.com/NASAJPL. Read on to learn about Arizona State University’s asteroid acumen, from NASA missions to meteorite know-how. Rock on … heavy metal … so many possible melodic puns, but let’s just stick to this one: It was music to ASU’s ears when NASA chose the university’s Psyche mission in January to be part of its Discovery Program. 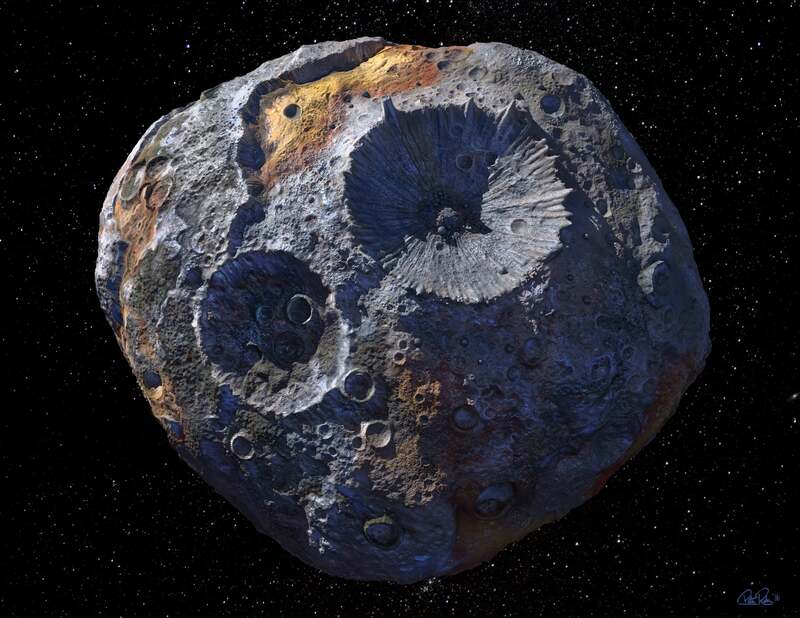 The mission — the first time ASU is leading a deep-space NASA mission — will examine the metal asteroid Psyche, allowing scientists for the first time to see what is believed to be a planetary core. The launch date was recently moved up one year to launch in the summer of 2022, with a planned arrival at the main asteroid belt in 2026 — four years earlier than the original time (some groovy math we wish we could apply to paying off our collector’s set of gold-plated Star Wars figurines). Speaking of interplanetary economics, Psyche principal investigator and School of Earth and Space Exploration Director Lindy Elkins-Tanton said at a spring celebration of ASU space missions that Psyche contains metals worth 100,000 times the gross domestic product of Earth. How worried do we need to be about a Hollywood-blockbuster type of cosmic collision? Not very. Laurence Garvie, research professor and curator for Arizona State University's Center for Meteorite Studies at the School of Earth and Space Exploration, has given public talks about asteroids, meteorites and the dangers they present here on Earth. His message: You’re safe, basically. Lots of space stuff falls on Earth — some 78,000 tons of it every year — but it’s mostly dust. And the majority of meteorites are only about a centimeter or so. Chicxulub, which slammed into the Yucatan Peninsula, wiping out the dinosaurs and trashing the entire planet, is likely to occur only once every 100 million years. In the metro Phoenix area, we’ve been hyper aware of temperatures lately, watching the weather forecast for any bit of relief. Regents’ Professor Phil Christensen is a temperature expert, but of a more outer-space kind. He’s the designer of thermal emission spectrometers on two separate NASA missions. The first — the OSIRIS-REx Thermal Emission Spectrometer, or OTES to its friends — was the first space instrument built entirely on the ASU campus. After months of rigorous testing, it launched with the OSIRIS-REx spacecraft Sept. 8 on its way to a rendezvous with the asteroid Bennu. OTES has several roles on the mission: determining the surface temperature and heat emission from all parts of Bennu at all times of day, and using long-wavelength infrared light to identify and map the asteroid’s minerals. The second mission carrying a thermal emission spectrometer designed by Christensen will be the Lucy Mission, which will investigate Jupiter’s Trojan asteroids. The device will measure with great precision the surface temperatures on each asteroid the spacecraft visits. Doing so will help scientists decipher the asteroids’ histories. Flight plans call for a 2021 launch for Lucy, which was named for the iconic fossil skeleton discovered by another ASU figure, paleoanthropologist Donald Johanson. Schoolchildren may know the mnemonic to remember the solar system planets in order: My Very Excellent Mother Just Served Us Nachos. But many might not realize that thousands of asteroids and minor planets revolving around our sun also have names (that would be one gnarly mnemonic, though we welcome anyone who wants to try to write it). Having a namesake in the sky is no small honor, and at least 14 people in the ASU community have received such an appellation accolade. Some of the meteorites found on Earth come from the asteroid belt (and some from the moon or Mars), but with so many Earth rocks lying around, how do scientists tell the difference? According to ASU’s Center for Meteorite Studies — which at 30,000-plus specimens has the world’s largest university-based meteorite collection — much of it has to do with age: Meteorites from the asteroid belt are far older than Earth rocks, which have been worn down and reformed repeatedly. That’s how scientists can tell the difference. But how can the average person know? Each fall, ASU hosts Earth and Space Exploration Day — as part of that, the public is invited to bring in what might be a meteorite for identification by Garvie. It’s a little bit like Antiques Roadshow, only with rocks; see a photo gallery here. Users of the Sun Devil Rewards app can also collect “pitchforks” and cash them in for a tour of the ASU meteorite collection, among other ASU experiences and swag. Learn more here; the app is being relaunched in early July.